Our private flute lessons generally start at age 7 and older, but sometimes younger students will start with a special curved-head flute. We have both male and female flute instructors and as with all our instruments, the teachers have university or college degrees in woodwinds. Our flute lessons are offered in 30 minute, 45 minute or 1 hour lengths. 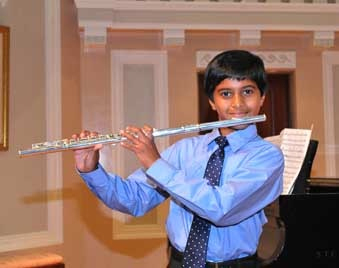 Our flute students have the option to perform in our Winter and Spring recitals. We offer a wide range of styles. Why should I Learn Saxophone? Saxophone & Clarinet Lessons - Our private saxophone lessons and clarinet lessons start from age 8 onwards. Earlier than age 8, a student typically does not have the lung capacity and strength to handle these instruments. Our saxophone and clarinet instructors are proficient on both instruments so a student can start with clarinet lessons if they wish and switch to saxophone lessons without having to change instructors. Our saxophone and clarinet instructors actively perform in all types of bands and ensembles and as soloists. Saxophone lessons and clarinet lessons are offered in 30 minute, 45 minute and 1 hour lengths. 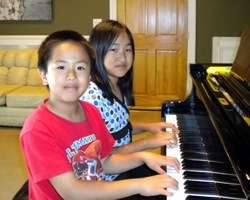 My 2 kids started the piano lessons at 6 and 8. They like the teachers and the piano lessons. The teachers are enthusiastic in the music and dedicated to students success. The school has the flexibility to arrange the lessons for my kids at the same time. Otherwise I would have to wait longer for them to finish the class one by one. 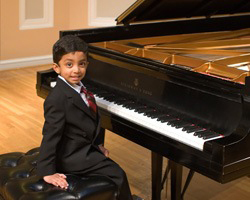 Piano lessons help kids in self esteem, coordination, and concentration. I would recommend this music school for the parents. Our son started learning Piano (private lessons) when he was a little over 3.5 yrs old. Even though our son enjoyed listening to music and is/was good at memorizing the tunes/songs ...we were a little skeptical about his ability to stay focused and learn Piano at that young age. Within a month's time we were pleasantly surprised to see his progress... Our son is now nearly 4 yrs 9 months and has already given 2 wonderful recitals. He now religiously practices piano every day...and enjoys attending his weekly classes. The piano teachers at Veksler Academy are very patient while interacting with young kids and yet very professional. We very highly recommend Veksler Academy ! Providing music lessons and dance classes to residents of Sunnyvale, Mountain View, Cupertino, Los Altos, Santa Clara, San Jose Since 2008.